I love a bargain! 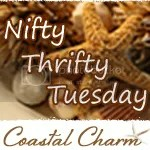 But finding an accidental bargain is even better! 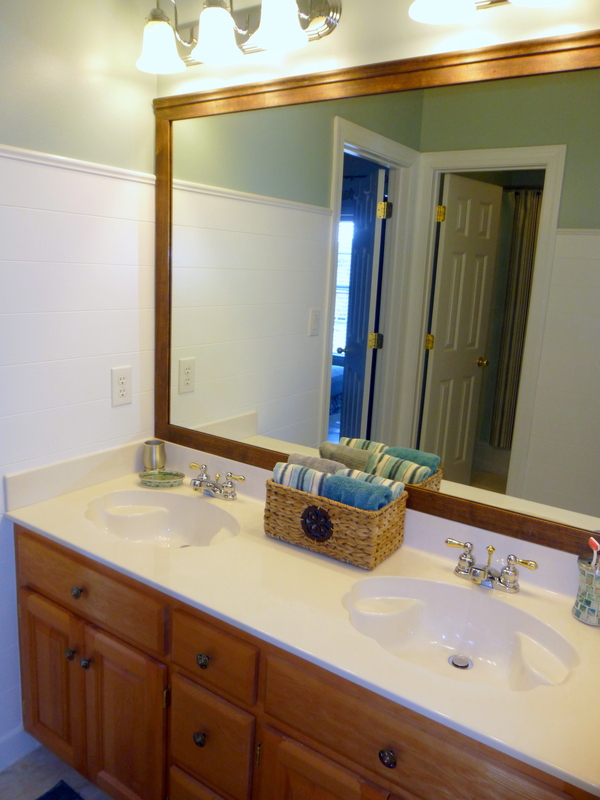 After the post on Wood Wall Planks, I was psyched to makeover my son’s bathroom. The day I went to Lowes to finally purchase the planks (I’d been looking at them forever! ), they were on clearance! Instead of $19.99 for a package of four 8 foot planks, they were priced at $3.50 a package!!! Holy Toledo!! I hit the mother load! I bought oodles of them. More than I needed for this project. For $3.50 each, I couldn’t help myself. 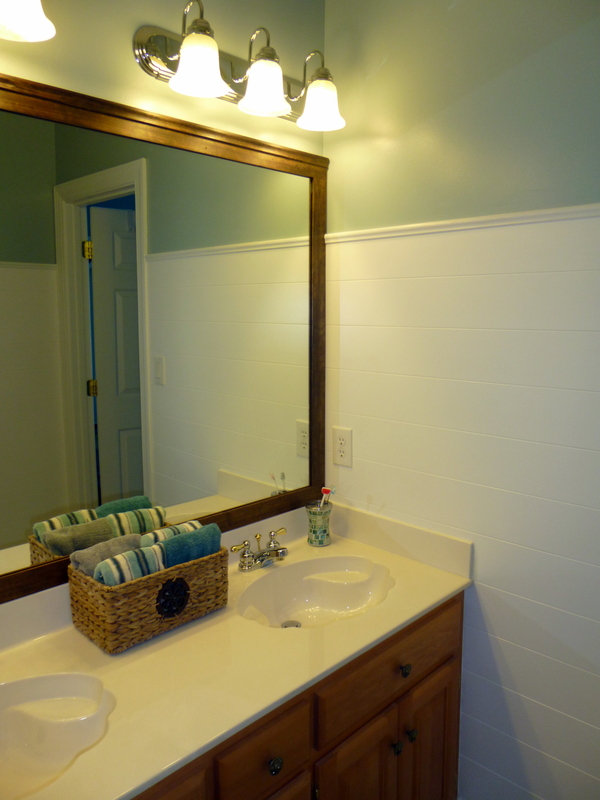 So, for less than $20.00, I paneled the bathroom walls. The “BEFORE”. 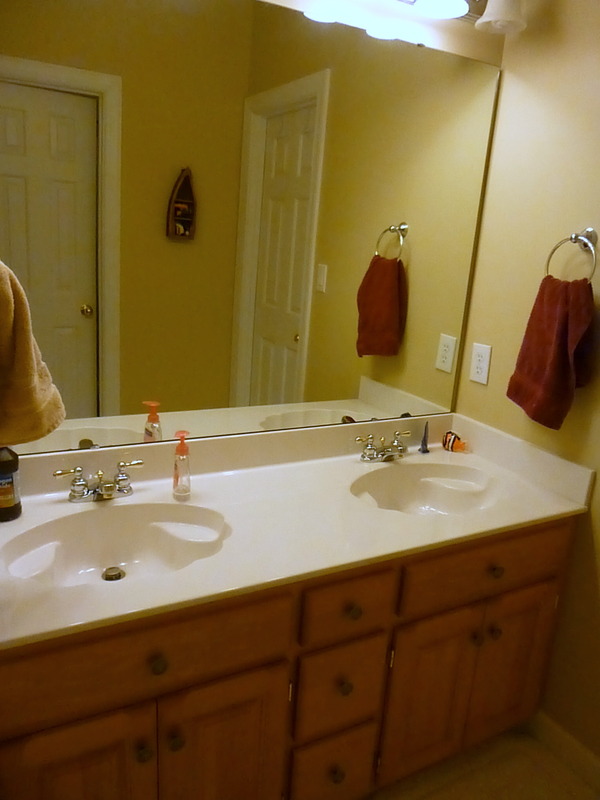 This bathroom is a “Jack and Jill” room. It has doors to two bedrooms and a separate door for the toilet and shower. Plain boring walls. And it has a huge, ugly “builder’s” mirror. The wood plank is EverTrue Edge V-Groove, Primed. As you can see, I decided to use them horizontally. It looks casual, beachy and more “boy” I think. 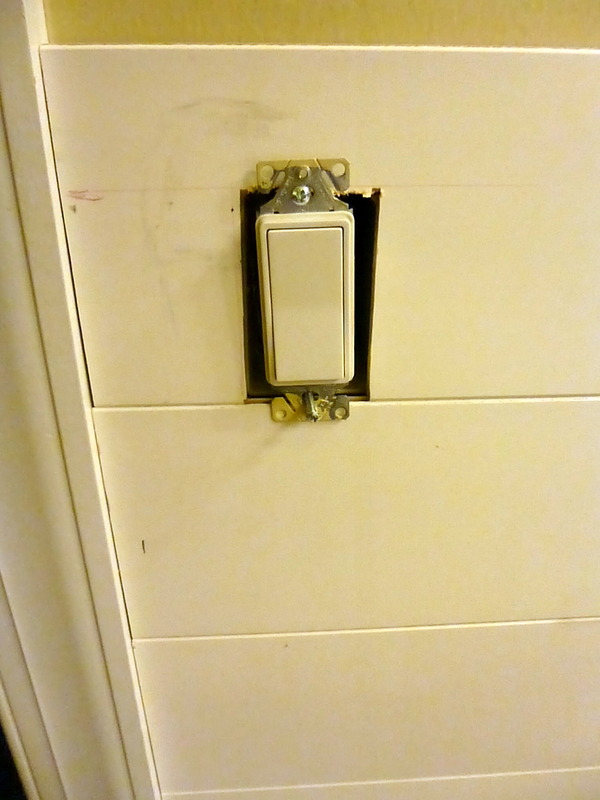 I used a jigsaw to make cuts for light switches and electrical plugs. Although, when my brother was here, I asked him in my charming sisterly way if he would do some cutting for me. He comes in handy. I asked for a nail gun with a compressor a year and a half ago for my birthday. 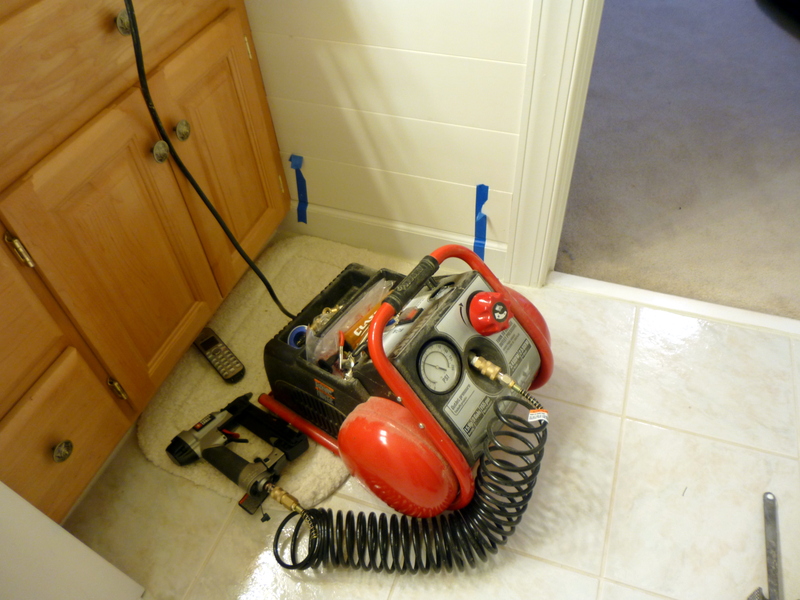 This project was the first time I used it. Let me tell ya people… it was so easy and so much fun! Love the nail gun! It made holes so small that when I painted the planks, the paint filled in the holes. No spackling! 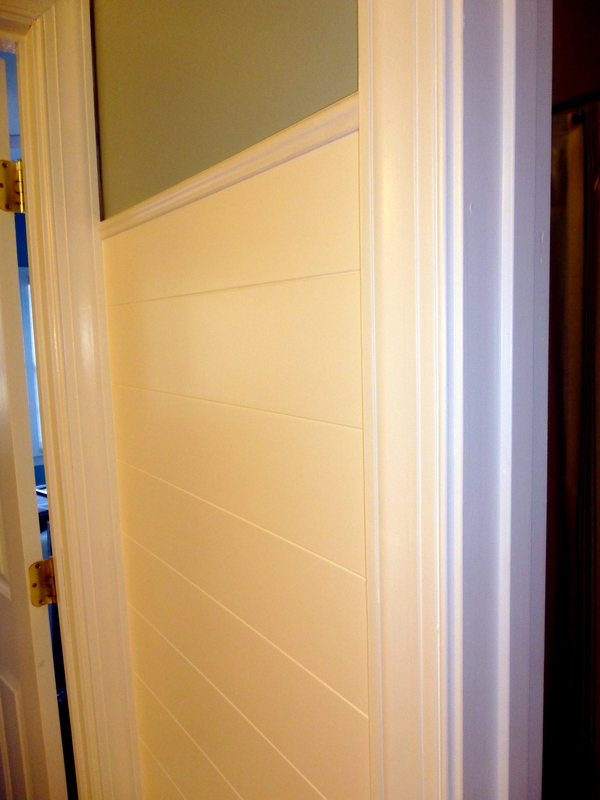 The white molding on top of the wood planks gives the wall a finished look. 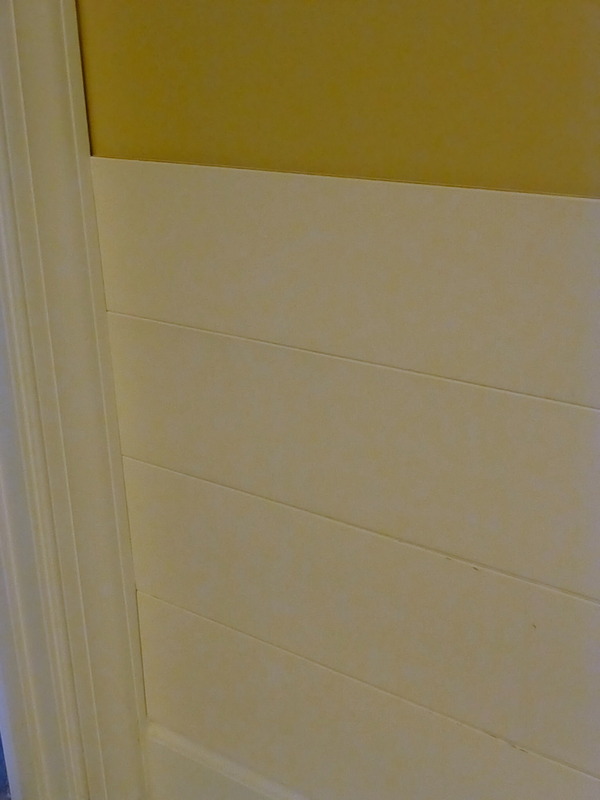 After the planks were up, I caulked all the edges and painted the planks a glossy white. Then I painted the upper walls Wedgewood Gray, a Benjamin Moore color that Lowes colored matched. Once the Wedgewood Gray was dry, I added trim molding to the top of the wood plank. I used lattice board to frame around the mirror. It was stained first with MinWax Wood Finish in Expresso on both sides. 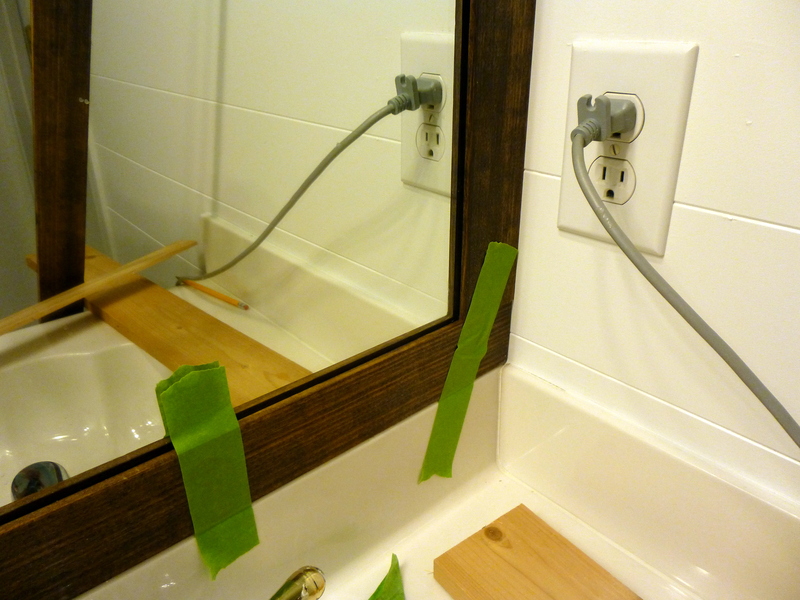 The boards are attached to the mirror with clear silicon. 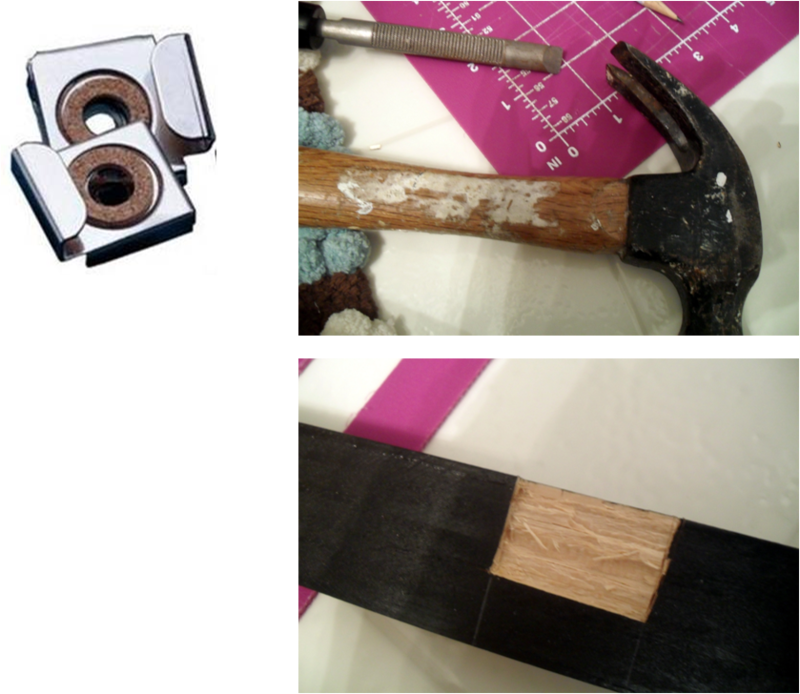 Because the mirror is attacked to the wall with clips, I used this method to get the wood to lay flush on the glass. 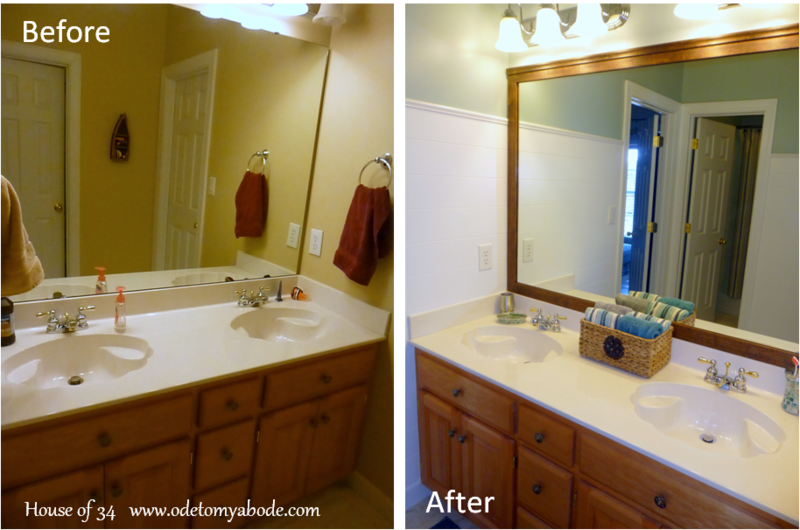 Since I don’t like “permanent” I did not want to glue the mirror directly to the wall. Painters tape is your friend when you need extra hands! 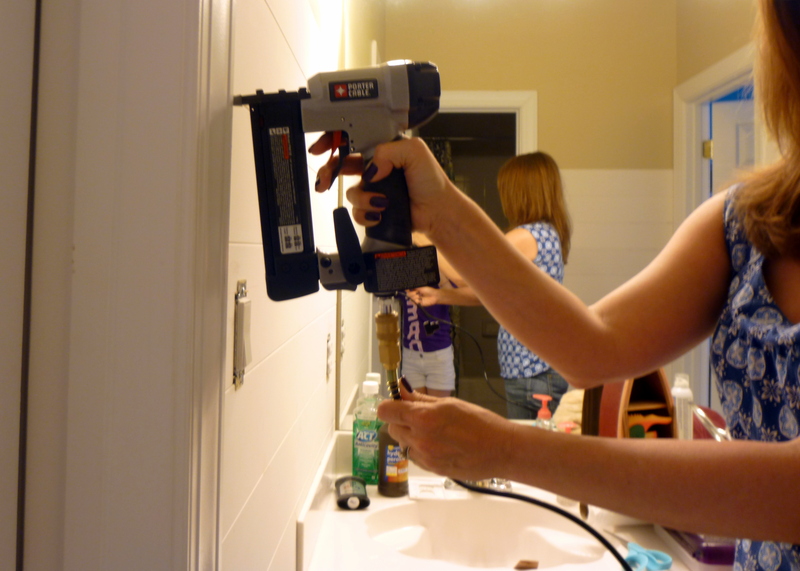 The trim I used to cap off the planked wall is the same trim I used for the top trim on the mirror. 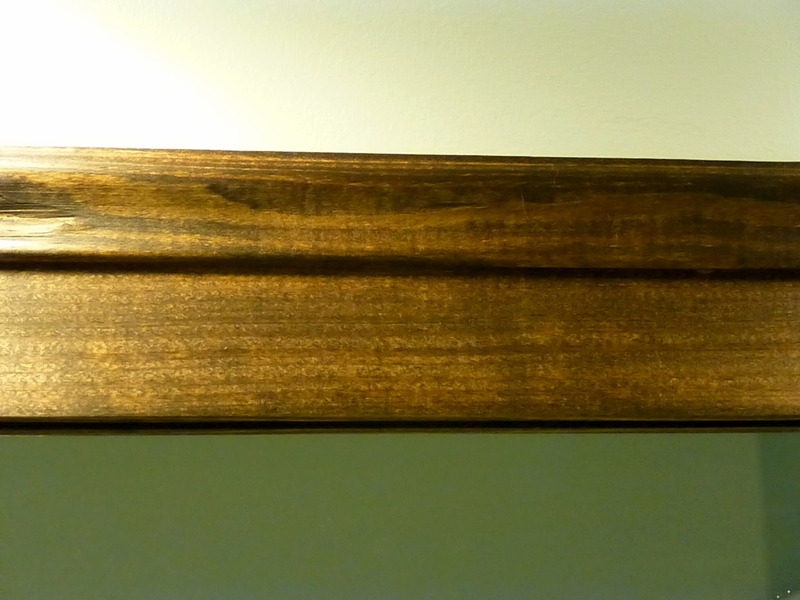 I just bought a piece that was unfinished so I could stain it, instead of the pre-primed trim I used on the wall. The AFTER. I can’t tell you how many pictures I took, and how many settings I tried, to get good pictures. (I didn’t succeed.) Taking pictures in a room with no windows and six light bulbs is challenge! Posted in DIY (you can do it!) 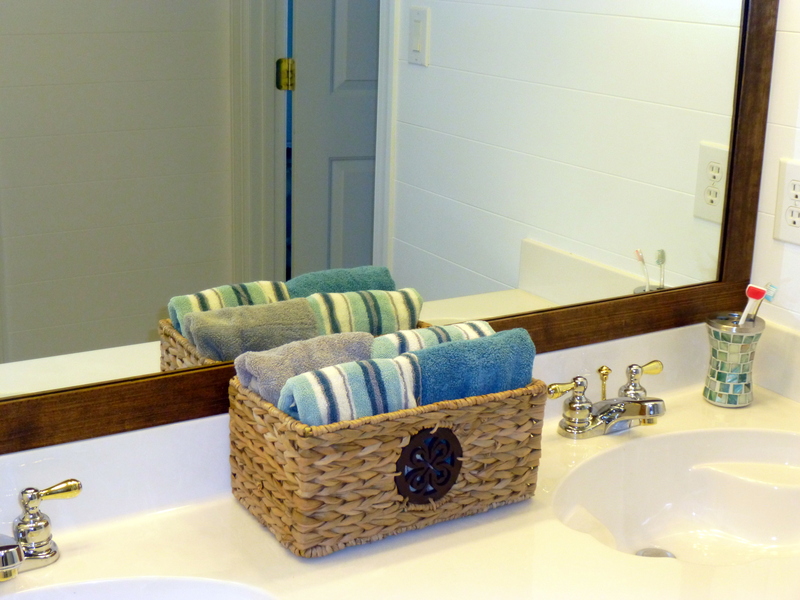 and tagged Bathroom, Bathroom Makeover, bathroom mirror, DIY, DIY decor, Do it yourself, frame, Home and Garden, home decorating, Home Improvement, Jack and Jill bathroom, Lattice, LOWES, Makeover, nail gun, paint, Plank (wood), wall planks, Wedgewood Gray, Wood Planks. Bookmark the permalink. I finally finished the frame shelf and it’s now hanging in my sewing room/office. WooHoo! Below is the link to the previous post showing the shelf in progress. 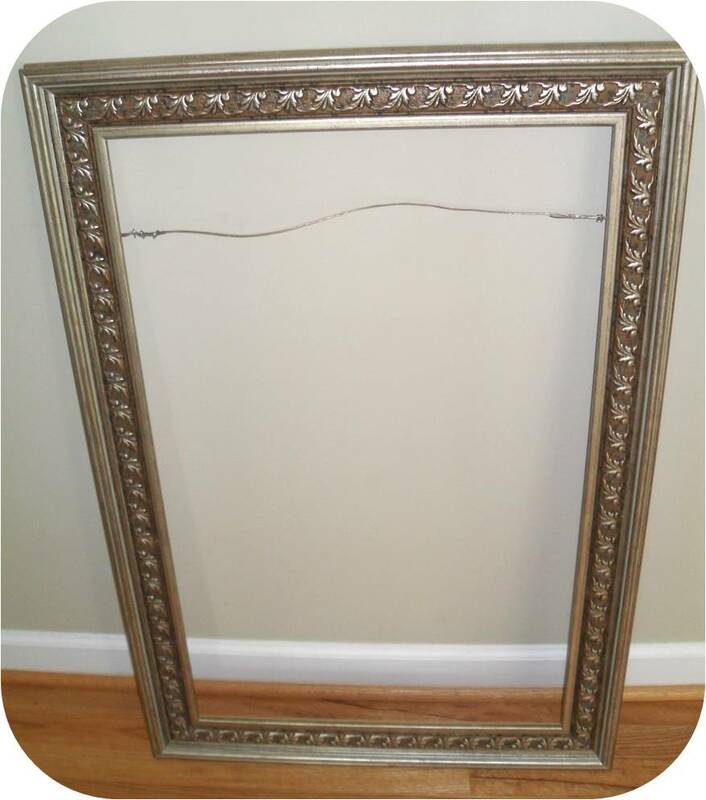 The frame was painted in white spray paint and the edges sanded for a distressed look. 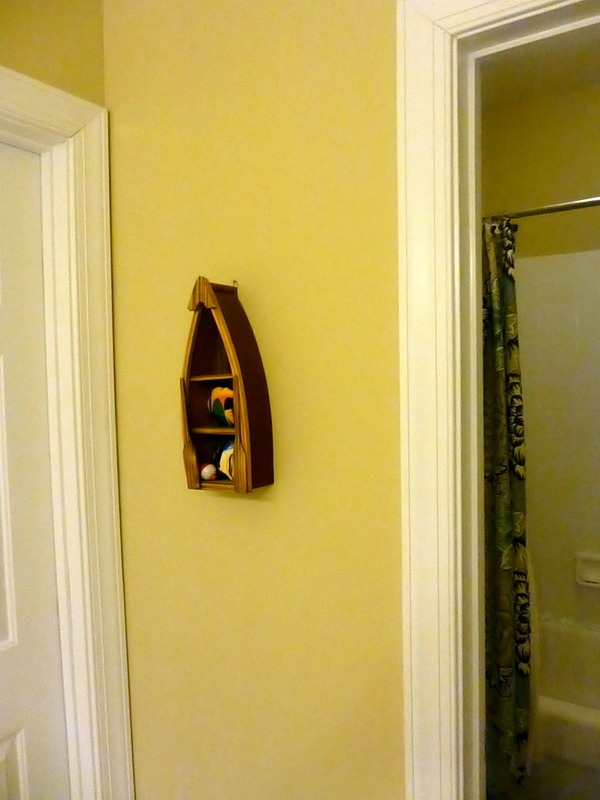 I used beadboard wallpaper on the sides, top and bottom of the frame. Very easy to apply with spray adhesive. 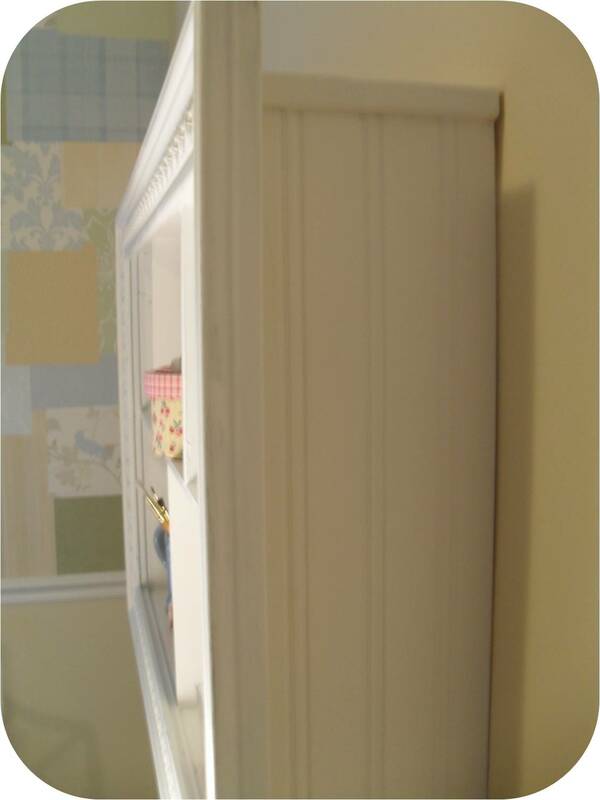 The corners of the box are framed out with moulding left over from the doll house project. I love this shelf! Hmmm… and I have so many more empty frames lying around! 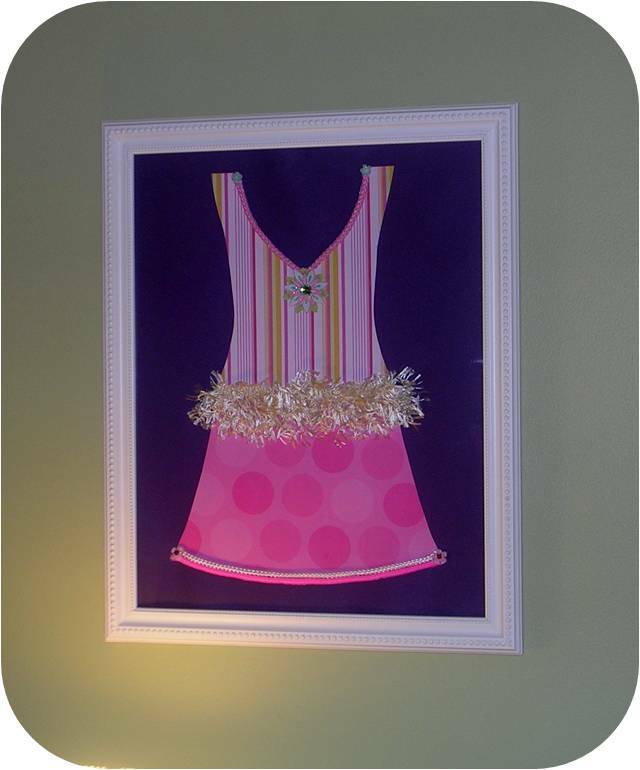 Posted in DIY Decor and tagged frame, painting, picture frame, shabby chic decor. Bookmark the permalink. 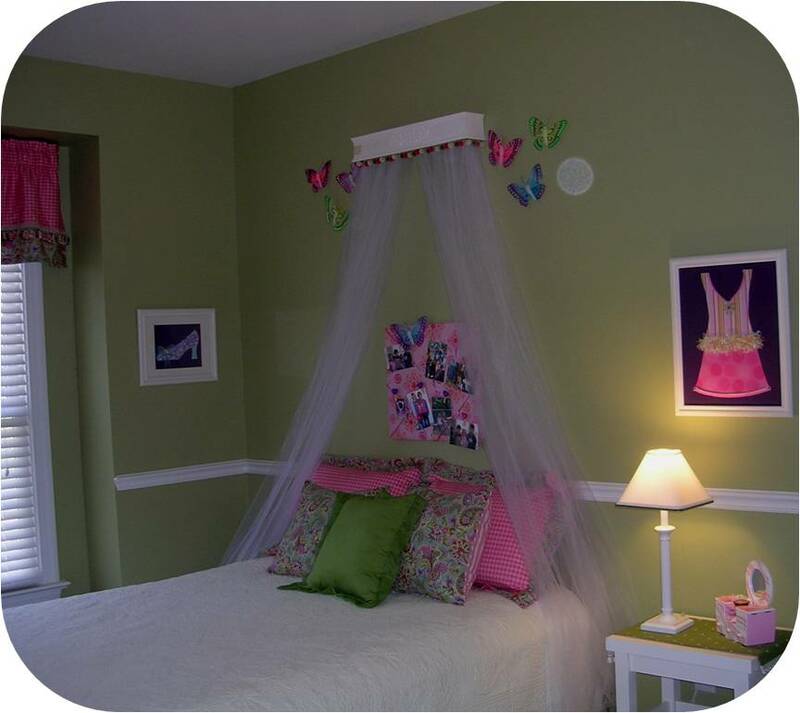 Every year begins with not a New Year’s resolution, but as a new year to redecorate! My family has come to expect that changes will take place after Christmas. I love change… as long as I’m the one making them! haha! I have a collection of pictures I no longer like. I keep them around for the frames. Not that I alway know what I’m going to do with them, but I just can’t throw them away. This frame came from a picture that I bought eight years ago when I decorated our new house for the first time. Now it is getting a new life. 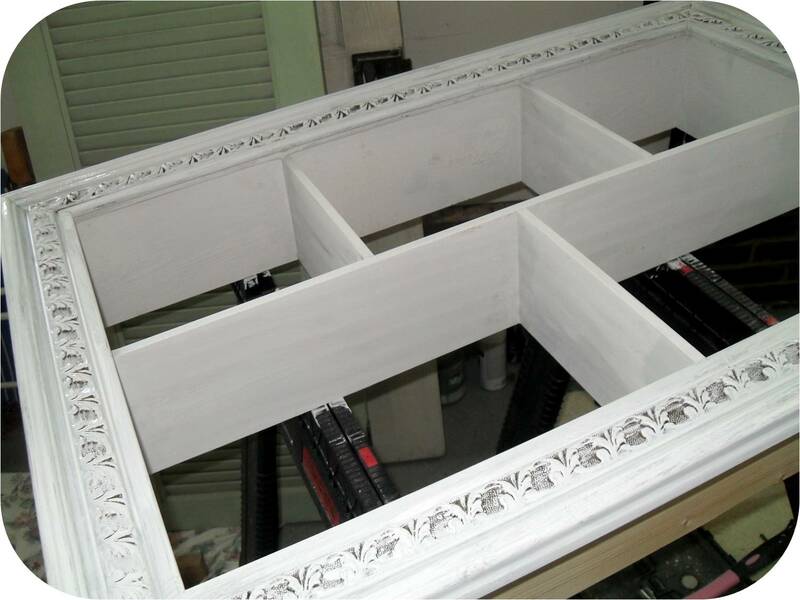 I have seen windows and frames made into shelves in salvage stores and antique stores and even home good stores. Love them! So here is my take on one. I created a box from 1 x 6 and attached it to the frame with wood glue. Tape is being used to hold the pieced together while the glue dries. I really need to invest in some clamps! 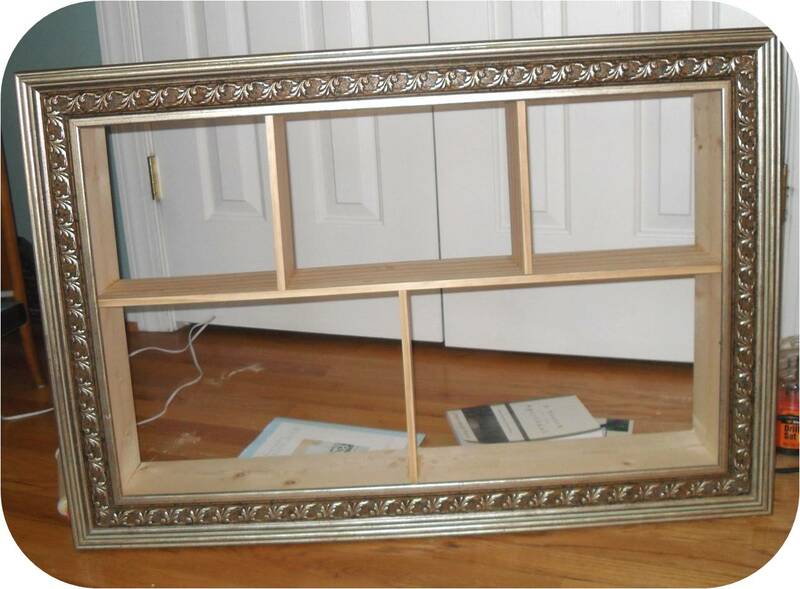 After the glue dried, I turned the frame over and nailed the picture frame to the box frame. Then I glued and nailed pieces of 1 x 6 x 3/8 thick wood for the shelf and dividers. I primed the shelves and picture frame with a brush. (Spray paint will also work.) This is a project in process. I will post more pictures soon. 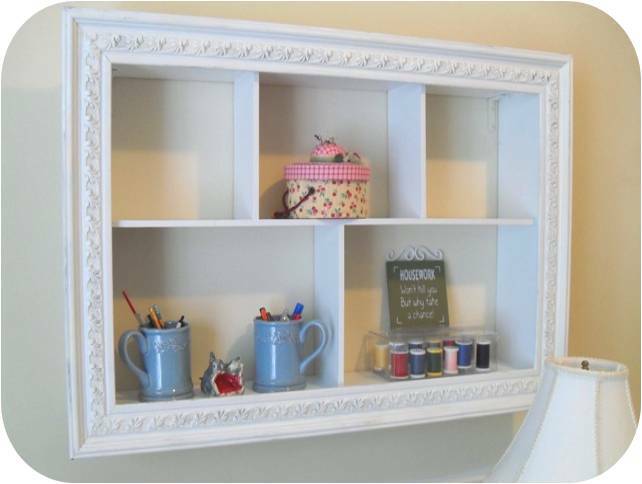 Posted in DIY Decor, SOS (tutorials) and tagged DIY, DIY decor, DIY projects, frame, home decor, home decorating, paint, picture frame, shabby chic decor, shelves. Bookmark the permalink. I got the idea for these pictures after walking through a new model home. (One of my favoritest hobbies!) I bought coordinating scrapbook papers and drew out the design for the clothes and shoes. I added some trim and scrapbook embellishments for decorations. That’s it! Glued it to a sheet of poster board and framed it. Very inexpensive art work and my daughter loved them! Posted in DIY (you can do it! 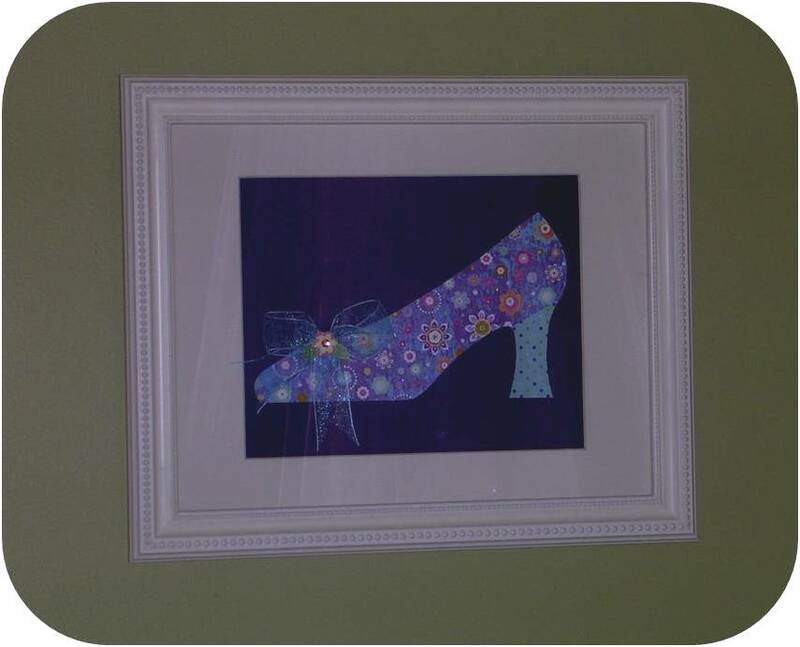 ), DIY Decor and tagged art, Arts, craft, DIY, dress picture, frame, girls bedroom, Paper, picture, Scrapbook, scrapbook paper, shoes. Bookmark the permalink.